But then everything went so very, very wrong. The U.S. Men’s National Team jumped out to a surprising 2-0 lead (on goals by Michael Bradley and Landon Donovan) over Mexico in Saturday’s Gold Cup final at the Rose Bowl, but couldn’t hold on as their top rival stormed back with four unanswered goals to claim the title. The “few guys” that Donovan referred to would be Giovani dos Santos and Javier Hernandez. The back four for the Americans – especially Jonathan Bornstein – simply had no answer to dos Santos and Hernandez, who were so much quicker all night long. Yeah, thanks coach. We noticed. 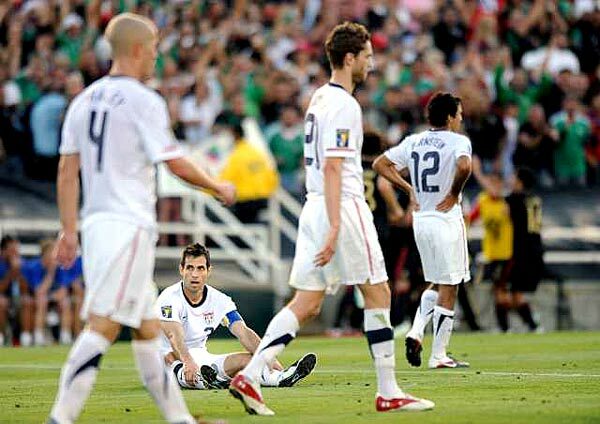 Going into the game, if we had known the U.S. would shutout Hernandez we would have been sure they would win. And despite some good tries on goal in the first half, Hernandez was held scoreless. But Mexico found its other weapons and the Americans just had no answer. So now what for Team USA? The usual calls for Bradley to be replaced have already begun – although that is probably not fair. Certainly a different voice in the locker room and on the training pitch can be an asset, but is that really what the team needs? For the U.S. to succeed – and we mean have real, sustainable success – there needs to be one clear message and style that starts with the junior teams and carries all the way to the top level. It has to be systematic with everyone buying in and everyone working toward the same goal. The problem with bringing in someone new to coach the top squad – for example Juergen Klinsmann or Sven Goren Erickson – is a coach of that stature is going to want to do things there way. And they are only going to want to do that through the next World Cup in 2014. After that? They’re back on the trail to the next job. And where does that leave the US team? As for Bradley, if he was a genius when the U.S. took a 2-0 – thanks in large part to Freddy Adu, who Bradley inserted into the lineup the past two days – did he really lose that in the second half? And Bradley’s not getting enough credit for keeping the U.S. on the attack once they went up 2-0. Even after falling behind 3-2, the U.S. didn’t give up and if Clint Dempsey’s shot found the back of the net instead of the crossbar at the 60-minute mark, things may have worked out differently. It’s possible that Mexico was just the better team on the night; it happens. But if there is one thing we can count on, it’s that the U.S. team will bounce back – it’s what they do. We like everything Tim Howard brings to the pitch, and we get a kick out of the fact that the U.S. can develop a top-flight keeper while England can’t, which is why we were supremely disappointed in Howard’s comments after the game. Howard blasted CONCACAF officials for conducting the title ceremony in Spanish. We get that Howard was frustrated, but there’s really no need for that.